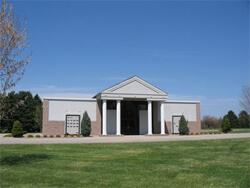 A mausoleum is a building to provide above-ground entombment. They can be either private or public. A community (public) mausoleum is a large building designed to provide for a number of people. Sharing the costs of the mausoleum with other individuals makes it more affordable than a private mausoleum. Crypts are designed to hold casketed remains. Following a casket entombment, the crypt is sealed, and a granite or marble front is attached. Niches will accommodate urns containing cremated remains. Following an urn entombment, a niche front of granite, marble, bronze, wood or glass is attached. Mausoleum crypts are both clean and dry. They offer a viable alternative for those who simply have an aversion to being interred in the ground. Furthermore, with the growing shortage of available land for cemetery use, mausoleums allow for a maximum number of entombments in a minimum amount of space. 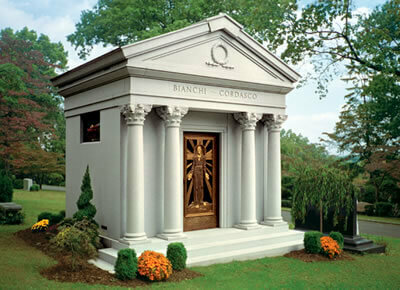 Mausoleums also protect visiting family members from inclement weather.